There’s been a mini-spate of low-budget vehicles for older actresses recently—shoestring-budget films that feel gossamer-thin, yet feature stellar, subtle work by their leading ladies. 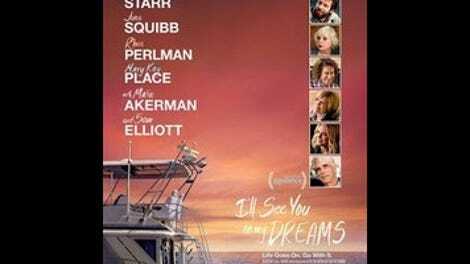 To Annette Bening in The Face Of Love and Patricia Clarkson in Last Weekend, add Blythe Danner in co-writer-director Brett Haley’s likably flimsy drama I’ll See You In My Dreams. Danner maintains that same level of emotional openness throughout the movie, even as Haley’s filmmaking remains stultifying. I’ll See You In My Dreams is a prime example of overlit shot/reverse shot cinema with nary a potent visual idea. Every image is gauzily flat and every cut can be predicted before it happens. Toward the end, there’s an evocative shot of a vase of flowers (with Carol backgrounded against it) that seems like a fluke, so otherwise uninspired is the film’s aesthetic. That’s a major flaw, yet Danner and the rest of the cast nearly right the balance. Sometimes it’s enough to stand back and let talented performers do their thing. The story revolves around several of Carol’s friendships, unlikely and otherwise: There’s her sassy trio of bridge-and-golf-playing pals (June Squibb, Rhea Perlman, and Mary Kay Place). There’s her concerned daughter Katherine (Malin Akerman), who comes to town for a visit, in addition to Lloyd (Martin Starr), a poet-musician wannabe who cleans pools for a living and becomes Carol’s confidant. And finally there’s Bill (Sam Elliott), a cigar-chomping pensioner with a smolderingly self-assured demeanor (and a boat, besides) who opens up the lonely protagonist to the possibilities of golden-years romance. Every actor gives their all, even when the material is insultingly thin. (There’s a medical marijuana munchies interlude that feels like it was ported over from a geriatric Judd Apatow production.) Elliott and Danner fare best together, mainly because of their swoon-worthy chemistry; it’s surprising that they’ve never worked together before this. Yet I’ll See You In My Dreams is primarily a one-woman show, nowhere more evident than in the sublime scene in which Carol sings a karaoke rendition of “Cry Me A River” that resonates with world-weary wisdom and plaintive regret. It’s a perfect showcase for Danner’s oft-underappreciated talents. Even fenced in by indie-flick amateurism, she soars to great heights.